Those prices are high, but Vancouver Island isn't exactly the most accessible for goods and services. I wonder how different prices are in the city of Vancouver. 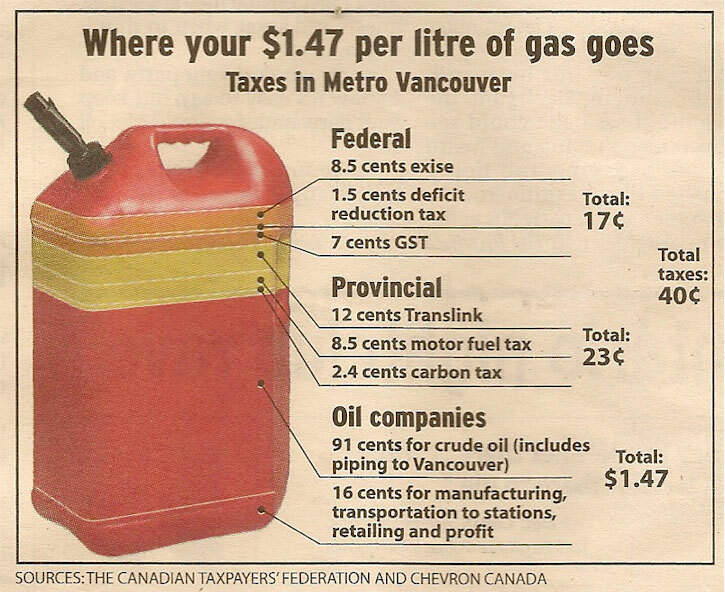 Vancouver is lumped into an area knows as the Greater Vancouver Regional District (GVRD) and within that catchment there is an additional $0.17/L of tax - Ouch! I would bet the transportation to stations cost is higher for Vancouver Island than for the mainland. I wonder how that tax structure compares to the US one, save for US consumers paying less. I've hoped for a big increase in fuel taxes for a long time, as I feel it's the only way American consumers will change their consumption behavior. Or a carbon tax. But I don't think it's ever going to happen. That whirring sound you hear are John Hancock, John and Samuel Adams, et al spinning in their graves! "Metro Vancouver" in my post is city of Vancouver (and area) price - they are ALWAYS way higher than we are on the Island. Not to be the "well, actually..." guy, but GVRD re-branded as "Metro Vancouver" a number of years ago. As for the pricing, out of the hypothetical "$1.47/L" of fuel in crash's graphic, we on the Island are subject to all but $0.144 of that. And yet, our prices are almost always closer to $.20/L less. Makes no sense to me either, as there's a pipeline that goes right into Vancouver, while all of our fuel on the Island is barged or ferried over on trucks. Last edited by Nuje; April 16th, 2019 at 09:56. Since January 1st regular gasoline has risen from about $2.20-2.25 to about $2.69-2.79 -- about a nickel a week for the last four weeks. Higher crude prices have pushed diesel up a bit, but AAA says the average price is 0.6 cents/gallon lower than one month ago. I can still find stations where D2 is $2.75-2.85. So the spread has really narrowed, and if gasoline keeps going up there soon be stations where the diesel is cheaper than the regular. I'll post a photo when I see it; if it's going to happen then it will happen by May 10th. That is historically the day when it happens. Diesel is running about .50/gal. more than RUG around here. Now, I drive more, worry less. Penguin -The other white meat. Diesel is within a dime of regular gas, around here. 2002 Red New Beetle TDI, Manual swap with .717 5th gear. I can't believe how much crap I can fit in this thing. Filled up on D2 at $2.99/gal at my local Mobil today. The Shell across town sells Shell-branded D2 (shocker, I know) for $2.89/gal currently.